Indolent cows languidly chewing their cud while befuddled motorists honk and maneuver their vehicles around them are images as stereotypically Indian as saffron-clad holy men and the Taj Mahal. Now, however, India’s ubiquitous cows  of which there are 283 million, more than anywhere else in the world  have assumed a more menacing role as they become part of the climate change debate. 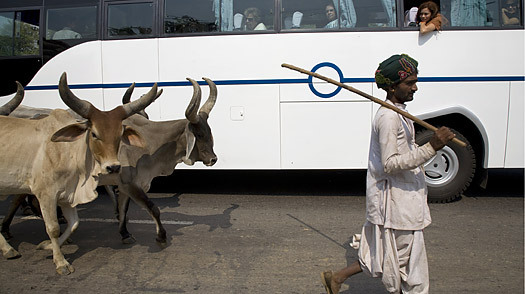 By burping, belching and excreting copious amounts of methane  a greenhouse gas that traps 20 times more heat than carbon dioxide  India’s livestock of roughly 485 million contribute more to global warming than the vehicles they obstruct. With new research suggesting that emission of methane by Indian livestock is higher than previously estimated, scientists are furiously working at designing diets to help bovines and other ruminants eat better, stay more energetic and secrete lesser amounts of the offensive gas. Last month, scientists at the Space Applications Centre in Ahmedabad in western India published a pan-India livestock methane emission inventory, the first ever, which put the figure at 11.75 million metric tons per year, higher than 9 million metric tons estimated in 1994. This amount is likely to increase as higher incomes and consumption rates put more pressure on the country’s dairy industry to become even more productive. For starters, most Indian livestock is underfed and undernourished, unlike robust counterparts in richer countries. The typical Indian farmer is unable to buy expensive dietary supplements even for livestock of productive age, and dry milch cattle and older farm animals are invariably turned out to fend for themselves. Poor quality feed equals poor animal health as well as higher methane production. Also, even when western firms are willing to share technology or when western products are available, these are often unaffordable for the majority in India. For instance, Monensin, an antibiotic whose slow-release formula reduces methane emission by cows, proved too expensive for widespread use in India. So the emphasis for Indian scientists is on indigenous solutions. “We know we cannot count on high quality feed and fodder,” says Singhal, “No one will be able to afford it. What we have done instead is develop cheaper technologies and products.” One example is urea-molasses-mineral blocks that are cheap, reduce methane emission by 20%, and also provide more nutrition so they’re easier to sell to illiterate farmers who don’t know a thing about global warming but want higher milk yields. Most dietary interventions work by checking methogens  microbes that thrive in oxygen-free environments such as cows’ guts, where they convert the available hydrogen and carbon into methane, a colorless, odorless gas. “We encourage well-to-do farmers to use oilseed cakes which provide unsaturated fatty acids that get rid of the hydrogen,” Dr. Singhal says. Another solution is herbal additives. Some commonly used Indian herbs such as shikakai and reetha, which go into making soap, and many kinds of oilseeds contain saponins and tannins, substances that make for lathery, bitter meals but block hydrogen availability for methogens. Dr Singhal says they are used in small quantities and the cows don’t seem to mind the taste. “Imagine how much potential they’d have in the international market,” he says.